The Eastern Peoples' Front, which is locally considered as a front organization of the Sinhala nationalist and Marxist Janatha Vimukthi Peramuna, Wednesday held a hartal (general shutdown) and demonstration in Trincomalee town against the presence of the Sri Lanka Monitoring Mission and the establishment of an Interim Administration for the northeast province, sources said. However the Police did not allow the demonstrators reaching the SLMM office, which is located along the Inner Harbour Road, Police sources said. Only shops belonging to Sinhalese were seen closed in response to the hartal call. Shops belonging to Tamils and Muslims were found opened. Schools functioned as usual. Work in the government offices were not disrupted. In short, normalcy was not disrupted in Trincomalee town, media sources said. 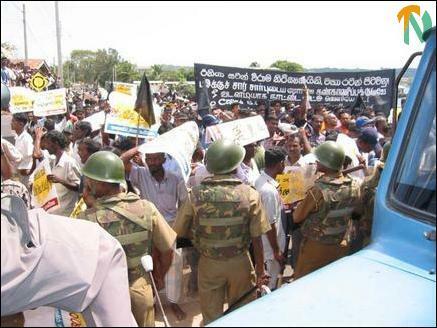 The anti-peace demonstration commenced from the fourth milepost on the Trincomalee-Kandy road Wednesday morning. Around 12.30 p.m. it reached the town and then proceeded towards the office of the Sri Lanka Monitoring Mission which is located along the Inner Harbour Road via Dockyard Road and Post Office Road. 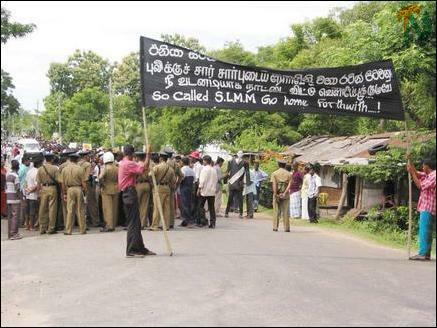 Protestors shouted slogans in Sinhala and Tamil languages, accusing the Prime Minister and the SLMM of joining hands to hand over the northeast to the LTTE in the name of establishing interim administration. The demonstrators were from the majority community, media sources said. 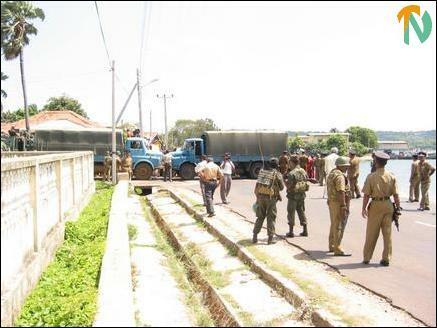 The police immediately barricaded Inner Harbour Road at the junction very close to the SLMM office by keeping two Police lorries across the road when the demonstrators attempted to go to the SLMM office with an effigy of the SLMM head in Sri Lanka, which they carried, from the start of the demonstration. Police riot squad was at the scene in preparedness to quell any disturbances if the demonstrators disobeyed their order, Police said. As the Police were strict in their position, demonstrators abandoned the idea of going to the SLMM office. 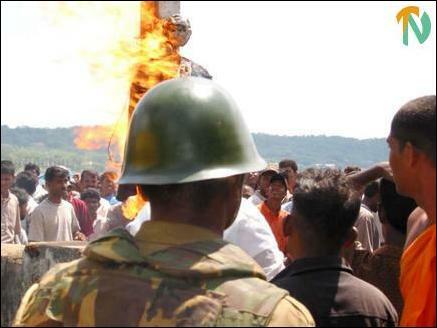 Later they tied the effigy with the electric post located at the scene and set fire to it amid shouts that the SLMM should immediately go home instead of aiding and abetting the LTTE to achieve its separate state in connivance with the United National Front government led by Prime Minister Mr.Ranil Wickremasinghe. Thereafter demonstrators dispersed from the site peacefully, the sources said. Trincomalee Senior Superintendent of Police Upali Hewage was at the scene directing the operation preventing demonstrators reaching the SLMM office, Police said. Trincomalee town and its suburbs were put under tight security Wednesday following the hartal call and the demonstration by the East Peoples' Front, police said.